An F-16 escorts two F-35 fighter jets arriving at Hill Air Force Base in Utah. Each stealth F-35 costs about $90 million. Wilson said the new National Defense Strategy says the military must "defend the homeland, provide a credible nuclear deterrent, win against a major power while encountering a rogue nation, all while managing violent extremists." "Each of those missions relies heavily on America's Air Force," she said. Wilson and others said the number of squadrons — a mix of fighters and drones, bombers and tankers — should grow from 312 today to 386 by 2030. That would mean the Air Force would expand to numbers not seen since the Cold War, when there were 401 operational squadrons. Among the increases: Bomber squadrons would increase from nine to 14, and refueling tankers from 40 to 54. Wilson said the Air Force will not add more missile squadrons but will "modernize our nuclear deterrent." And cyber squadrons would also not increase, though "we will develop new tools for the squadrons we have." The entire effort, say officials, would require personnel levels to increase by about 40,000 to operate and maintain the aircraft. Wilson and Air Force Chief of Staff Gen. David Goldfein said they have yet to come up with a dollar figure for the increases. But Todd Harrison, a defense budget analyst with the Center for Strategic and International Studies, estimated that it would cost the Air Force an additional $18 billion a year just for the personnel and aircraft operations, training and recruiting. Harrison said that figure does not include the billions of additional dollars needed to buy the aircraft, including the pricey F-35, at about $89 million each. 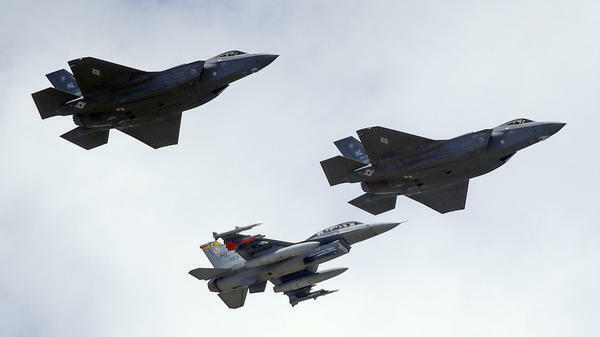 "If they are buying many more F-35s, then the costs would be higher," said Harrison. "I could not hazard a guess on this without knowing the mix of aircraft involved." For years now, defense analysts have pointed to the increased military power of China and Russia. Both countries recently partnered on a large military exercise. Most analysts point to China, with its robust economy and increasingly hostile moves in the South China Sea, as of particular concern. "China is a big issue," said David Finkelstein, vice president and director of China studies at the Center for Naval Analyses. "The [People's Liberation Army] is moving to become a joint force that is focusing on power-projection services such as the navy, air force and rocket forces," Finkelstein said. "China wants the seas and skies of the Western Pacific to be contested territory. And even if Chinese technology is not as good right now, they are cranking out a lot of ships, and the PLA force is flying over water for the first time. So there are concerns." Andrew Krepinevich, a longtime defense analyst, pointed out that the National Defense Strategy says the U.S. only has sufficient force to address one of the major threats — Russia or China — and deter the other. "The kinds of forces you would need to defend against Russia are materially different than the ones you would require against China," said Krepinevich. "The Far East is a much more of a maritime and air theater while Europe is more of a ground and air theater. The Pacific has much greater distances, so you tend to value range more than you would in Europe." "We haven't had a statement from the Defense Department," he continued, "about what those forces are likely to be. At least in my estimation, you'd have to make a choice between Europe and Asia. So for me China is clearly job one for the U.S. military." But the question for the Air Force is this: Is the service placing too little effort on cyberwarfare or on space operations, and instead focusing on perhaps the old-fashioned answer: fighter aircraft and bombers? "It's old-fashioned in the sense we're still looking at aircraft and pilots," said Krepinevich. "Questions that have been unanswered are to what extent are cyber-payloads going to be prominent in the next war, especially against a great power? To what extent is the Air Force going to be able to rely on space as it does now? How quickly can it repopulate its space architecture and with what kinds of satellites? Is stealth going to be still effective against some of the advances in technology that can be applied to help reduce its advantage?" And among the most basic questions is whether Congress will agree to pay for such a large increase in Air Force operations. "We have a two year bump-up in the defense budget," said Krepinevich. "It's an increase but it's not the kind of increase that would give you a 25 percent increase in forces structure. "Where you look at where Congress is right now," he said. "It's not at all clear they're going to get those kinds of increases."